ysabetwordsmith | Location Notes for "Sacrificed Part of Himself"
Location Notes for "Sacrificed Part of Himself"
Here are the location notes for "Sacrificed Part of Himself." This is the home of Officer Pink (Ansel Nicholson) which used to be part of a resort alongside a lake. When the resort closed, the rental cabins were parceled into individual lots and sold, while some of the resort's main facilities -- such as the lodge and the main boating dock -- were set aside as neighborhood resources. See the exterior and main floor plan. Here is the bathroom. Enjoy an aerial view of farmland outside of Bluehill. Here you can see rolling hills of farmland heading toward Taum Sauk Peak. In Terramagne-America, small-to-medium sized family farms have remained common, and there are fewer large-scale factory farms. There are about half a dozen large clusters of buildings and about as many individuals houses or barns scattered around, so you can pick out at least a dozen farms there in a mix of crop fields, pastures, and orchards. 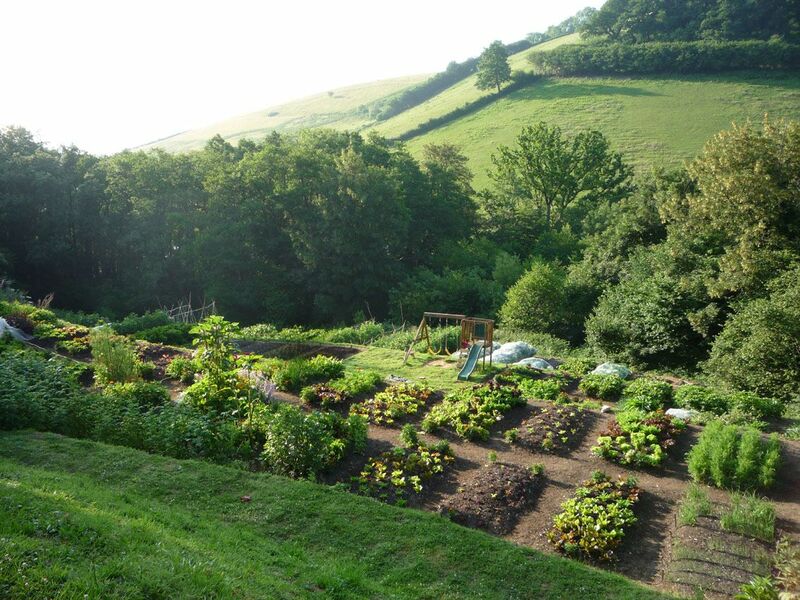 Ansel's grandparents have a farm, and it is the farmiest farm ever to farm. It's located just outside of Bluehill. The tall red barn houses the horses. The garage for farm equipment is the brown building broadside below it. Left of the driveway, the small gray car garage is just barely visible behind the house. In front of the house is part of the garden space, primarily holding bushes and berry canes. The pond is a long, lobed catchbasin that rambles along the base of the ridges above it, and the ducks are kept close to the pond. Part of the garden lies behind the house. Norma Jean loves gardening, got into the habit of growing huge ones to feed all her kids, and has kept up with it because she likes feeding people. She just has more of them now, distributing some of the produce to her adult children, grandchildren, and great-grandchildren. Or anyone else who shows up at the house. Ansel's grandmother Norma Jean has a flock of mixed chickens for eggs and meat. She also saves the colorful feathers for crafts, including fly tying. (She is an expert fly-fisher.) There are many options to choose from, and T-America has done better in maintaining breeds for small farms. 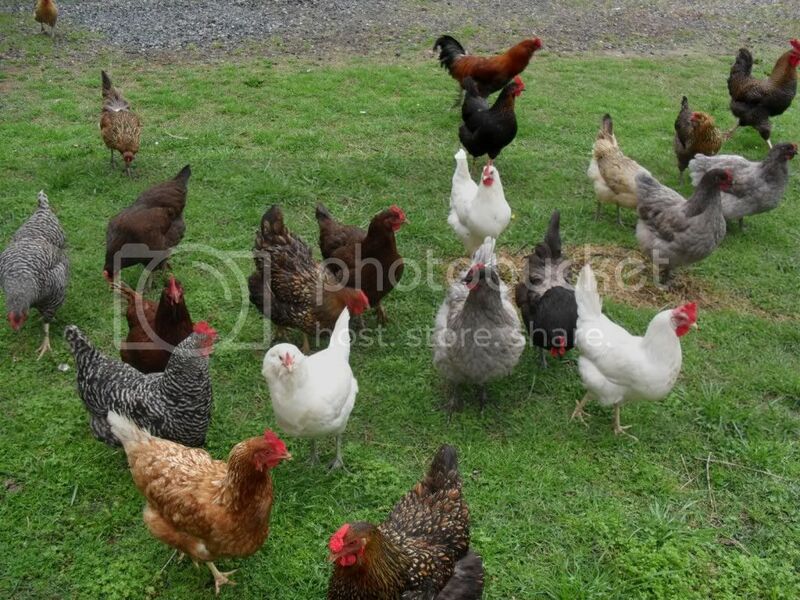 Breeds include Wyandottes (partridge, chocolate, buff, golden laced, etc. 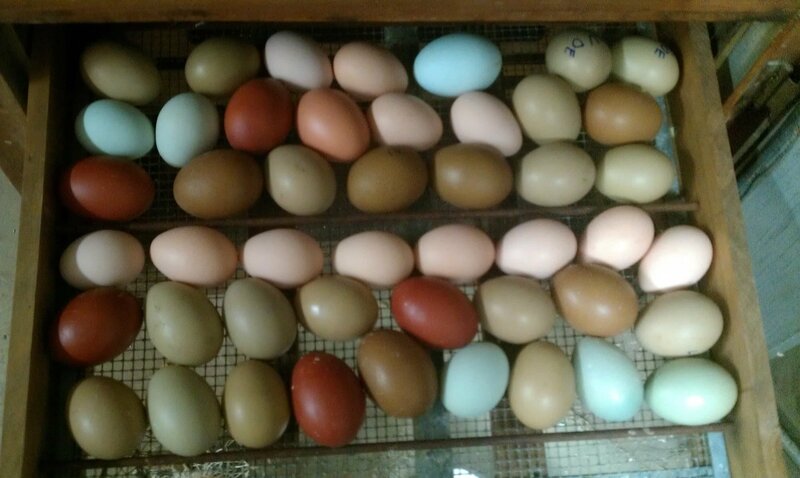 ), Plymouth Rock (barred), Rhode Island Red, Buckeyes (also red), Marans (copper black, blue copper, wheaten, etc. 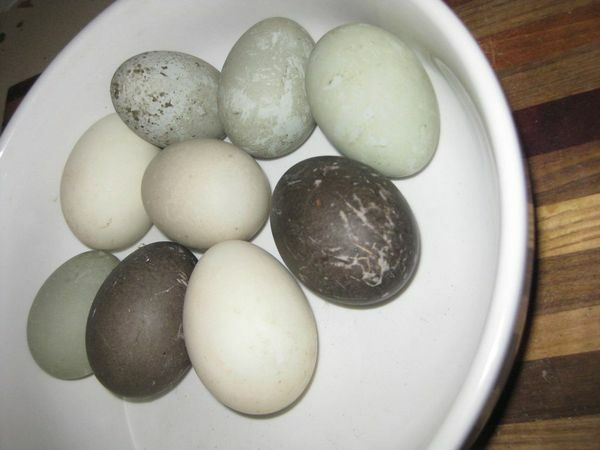 ), Lohman Brown (red with white tails), White Leghorns, and Easter Eggers (any color including white with blue legs). Much of the time they just roam free around the farm. There are several dozen of them, usually two roosters and the rest hens. Norma Jean trades or sells the extra eggs, and has a sign at the head of the driveway advertising them. 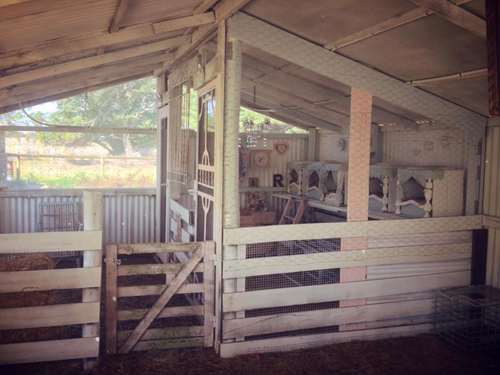 The main chicken house has indoor nesting and exercise space plus a large outdoor run. Here are some tips of raising chickens for eggs. 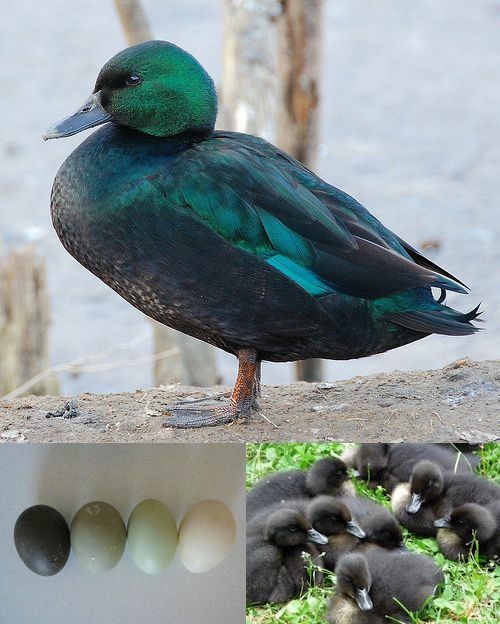 Heritage duck breeds also come in various types, some intended for egg production. 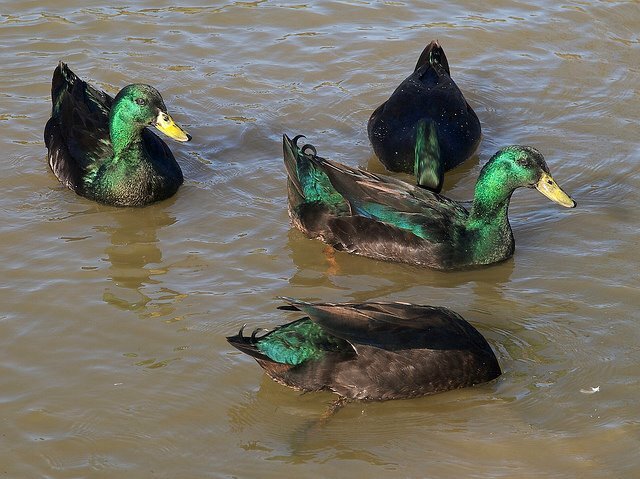 Norma Jean raises Ancona and Cayuga ducks partly for their eggs. 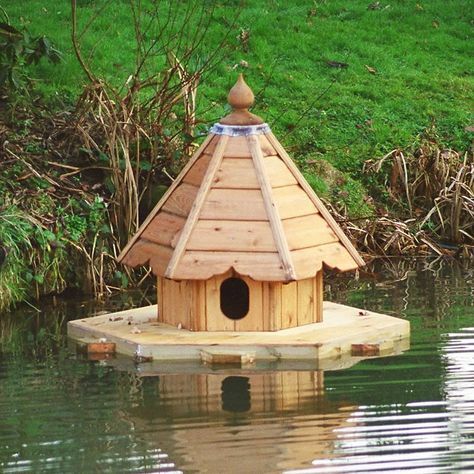 These floating duck houses make it possible for the ducks to stay out overnight in warm weather, because predators can't easily get to them in the middle of the pond. 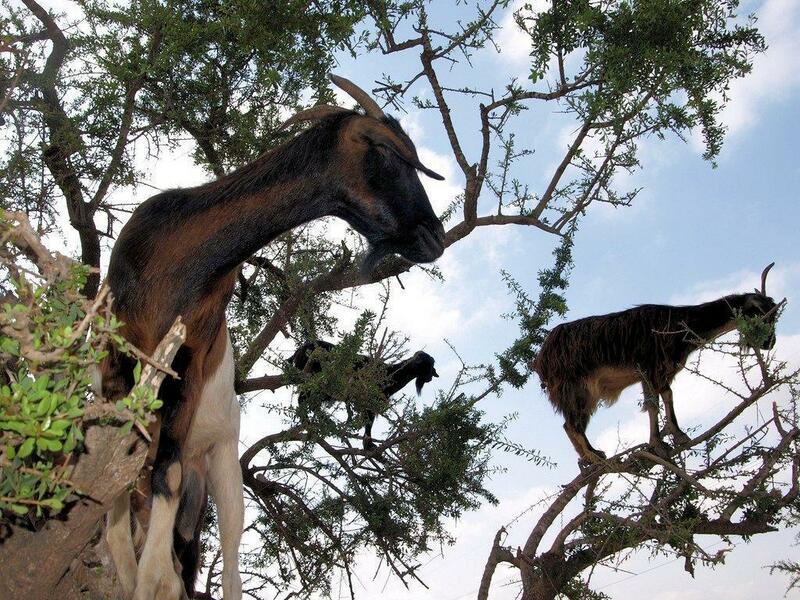 The Missouri Climbing Goat is a T-American breed developed from Nigerian Dwarf Goats crossed with Moroccan Draa Goats. These small, hardy animals not only subsist on poor forage, but excel at climbing rocks and even trees in search of food. They have agile hooves that can curl around to grip twigs and find even the smallest footholds. Forget keeping them in a pen unless it has a roof. 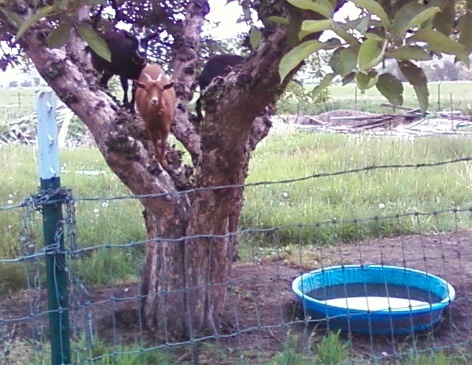 For this reason they are sometimes called "squirrel goats." They resist disease and withstand heat well. While they can tolerate a mild winter, moderate cold usually means they need some protection. They produce abundant milk for their size, about two quarts a day, although not as much as larger dairy goats. Conveniently, these goats breed year-round and have a long lactation span, making it easy to ensure a regular supply of milk. Sweet and flavorful, its high butterfat content makes excellent cheese. Norma Jean makes a variety she calls Squirrel Cheese. The process is similar to Andalusian goat cheese. 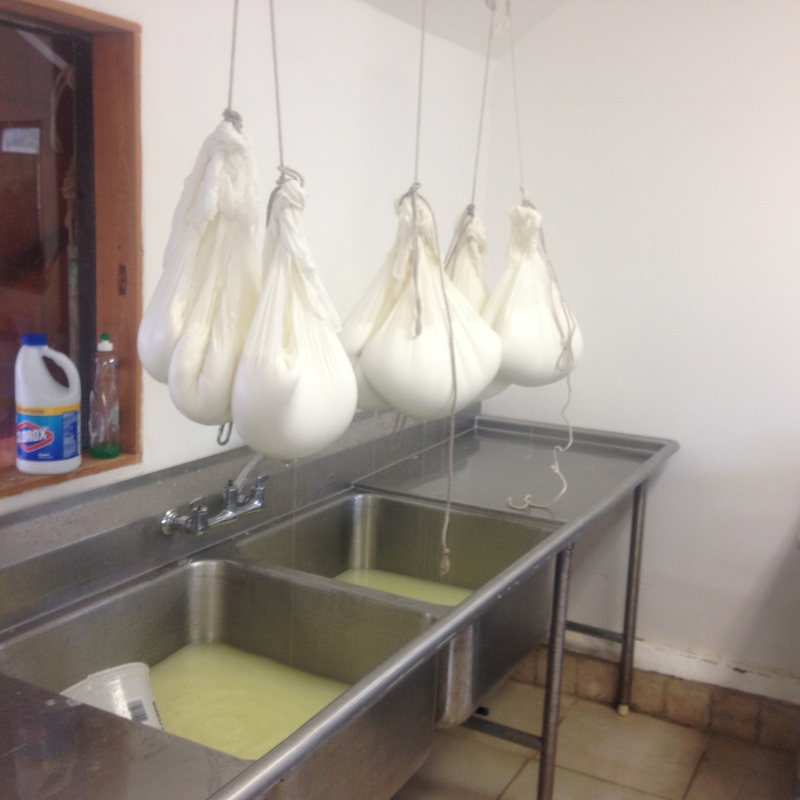 Squirrel Cheese is made with fresh raw goat milk, curdled with homemade calf rennet, packed into a weighted press, salted, then hung to dry. It can be eaten soft the next day, or preserved. After about a month of drying, it becomes hard and yellowed. Finally, it is placed in a bathtub, covered with winter wheat at least a foot deep on all sides, to be cured for four months. Norma Jean has a row of salvaged bathtubs with tight-fitting decorative covers, for aging the cheese. It comes out with a very sharp, nutty flavor and grates beautifully. She likes to cut the cheese into small cubes, flour them, and fry them into croutons. 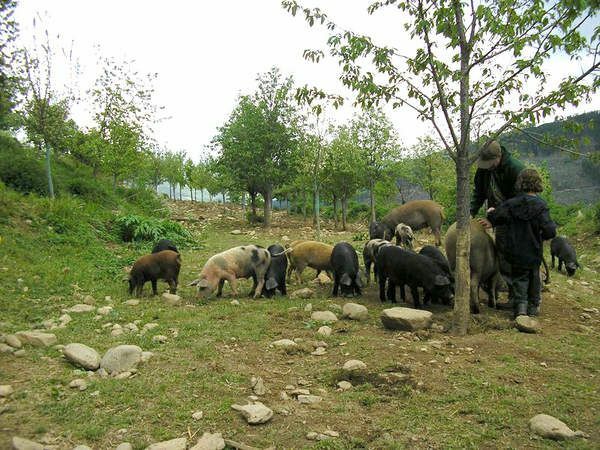 A mixed herd of pigs is moved around the farm as needed, most often under the orchard or other trees. These include several heritage breeds, among others. The black-on-white Gloucester Old Spot is a famous foraging breed nicknamed "the orchard pig" which is good for flavorful meat, lard, and bristles. The black Mulefoot Hog is a solid-hooved breed native to the Mississippi River Valley and adept at foraging the bottomlands, good for lard and hams. The red Tamworth Pig is another excellent forager favoring nut forests, ideal for bacon. Heritage breeds remain more popular in T-America than here, due to a more traditional approach to farming. Given differences in farming styles, heritage breeds never declined as much in T-America as in L-America. Pineywoods is an American breed of cattle descended primarily from Spanish stock. As in L-America, the Pineywoods population in T-America dwindled enough to develop isolated strains, but they have a lot more of those, and they spread throughout more of the South including Missouri, Arkansas, Louisiana, Tennessee, and Kentucky in addition to Mississippi, Alabama, Georgia, and Florida. Barnes is a Florida strain also found in Alabama and Georgia. Small and rugged, Pineywoods have excellent disease resistance and are gentle enough to make good draft animals. Colors in cattle vary according to genetics. Luckett is a Missouri strain, a handsome mix of red-and-white, black-and-white, and especially prized tricolor cattle that do well on lush to poor pasture, can browse if necessary, withstand sweltering summers and moderate winters, and produce fabulous beef. Their nickname is "calico cows." They typically have medium-long, elegant horns. They are enthusiastic about clearing tough weeds, although they have to be hungry to browse woody forage. They can be milked, but don't produce as much as the milker strains of Pineywoods, let alone a true dairy breed. Conrad raises these mainly for their meat, but he moves them around the farm for weeding and allows them to glean fields after harvest. He also enjoys showing Pineywoods and keeps a few teams of oxen for light draft work. For heavy draft work, Conrad keeps a pair of genuine Budweiser Clydesdales, appropriately named Pride and Joy. Pride is a gelding with a shaggy white beard and white flecks on his body. Joy is a mare with white creeping up the sides of her belly and hips. 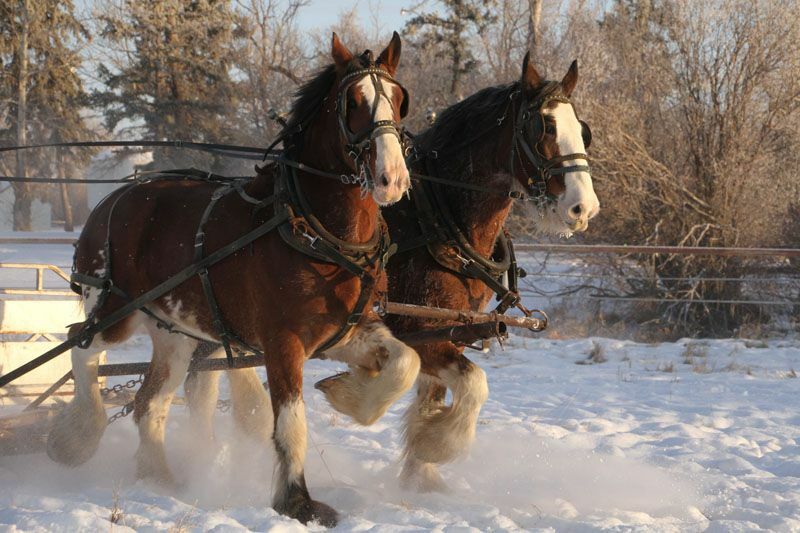 Both have the handsome bay coat and powerful build of the Budweiser Clydesdales, but were disqualified from their home farm due to imperfect markings. Ansel's grandfather uses them for plowing, logging, and winter sleigh rides. They also extract stuck vehicles from mud or snow when a tow truck can't get through. Conrad keeps a herd of Missouri Fox Trotters, although most of them belong to other family members. As you can see here, a majority are chestnuts or claybank duns, with the occasional paint or palomino. The dun gene means they also get grullos if mating with a black stallion. Sometimes they get a red or blue roan. Here is the front porch to Ansel's grandparents' house. The wooden door bracketed by lanterns is the front door. It opens into the hall between the den and the living room, with two gaps in the interior wall of the living room to allow access from the hall. The white one is a side door that lets into the living room. The basement rec room has space and equipment for at least a dozen people. 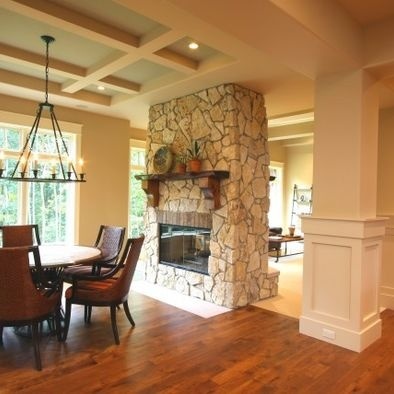 It also has enough open floor space to serve as a playroom for children. This board game room seats up to 10 people. Most of the wooden furnishings in here are things that Ansel's grandfather built. The narrow gap in shelving near the middle of the picture leads into the alleys between the shelves. There are two rows of freestanding shelves and another against the back wall. Games with shallow boxes go back-to-back on the double-sided shelves which can be accessed from either side. Games with long boxes go on the back shelves against the wall, which can only be accessed from one side. There are about 60 games visible on the upper right section of shelf, and the cases have three sections. There are three rows of cases, the front two double-sided, the back single-sided. At maximum capacity, that's 180 on the top shelf facing into the play area, 360 on the top of that case, and 720 on the two freestanding cases put together; plus another 180 from the top of the back shelf, for a total of 900 on the tops. The lower shelves have stacks of either four or five games, and there are six stacks per shelf, so 24-30 games per shelf, for an average of 27. There are four lower shelves per section, and three sections, so twelve shelves; which means 324 facing into the room on the lower shelves. That's a total around 504 games on the front face, which is fully loaded. The back side of the first case is fully loaded too, for a total of 1,008 on the lower shelves. So the front case holds about 1,368 games. At maximum capacity, the three cases could hold around 3,420 games. The middle case is about half full, and some of the games are stored vertically like books instead of stacked; the back case is also partially full. That puts the current collection on the shelves around 2,224. The small bookcase at the open end of the aisle cannot be seen clearly, but may have around 60 more board games, bringing it up to 2,284. The narrow white cabinet at the closed end of the aisle holds some oddly shaped equipment and games with tall boxes, probably between 12-24, so average of 18, for 2,302. The large white cabinets hold around 35 games per door-side, if counting one game per box plus several on the open shelves, which would be 140; but the card games can be stored much more densely, so it's probably closer to 200 small games in there, plus loose pieces. Plus at least 45-50 from the wall behind the nook table. That's roughly 2,550 games in all. There is room to add many more games without needing to add more storage space. Here is the board game room showing the door. The small wooden table comes with several chairs. Here is the card table with chairs, and the wide white cabinet. This is the alley between shelves looking back toward the tall white cabinet. Here is the same alley looking toward its entrance. This nook table has leaves to make it longer. Ansel's grandmother has made many tablecloths in various sizes to serve as custom game boards. Sometimes she makes game pieces out of things like felt or popsicle sticks, other times she just lets the players use whatever random pieces they want from the miscellaneous stash. Her children loved playing with uniquities in parks, and wanted to do that at home, so this was her solution. It has since become a family tradition. Behind the table and under the bench, you can see more game storage. 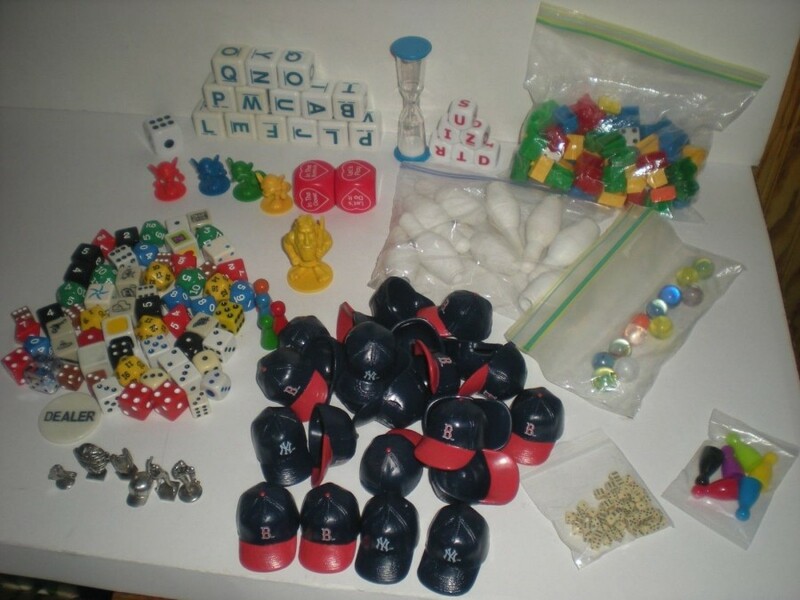 The plastic tubs hold games or toys with large awkward pieces, such as stacking-block games. Those flat white boxes hold collectible card games. Atop the shelf are some wooden boxes with deluxe sets of games such as chess, checkers, backgammon, go, and scrabble. There are at least 45 games visible, and probably more considering that some containers could hold multiple games. The cabinets hold plastic drawers full of small games and game pieces. Here are some miscellaneous game pieces sorted by type. 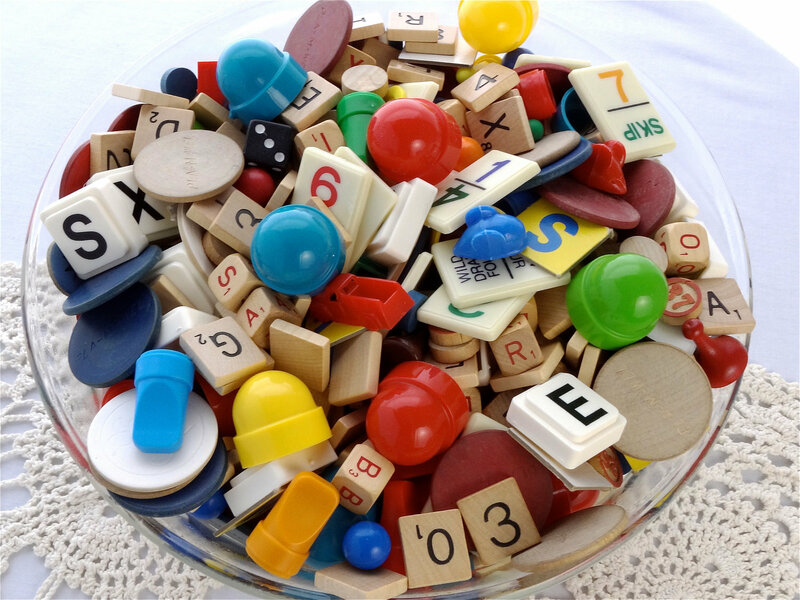 This is a bowl of random game pieces. Kids love to play with this stuff, often just sorting it out and messing around with it. But you can make an educational game out of it just by saying, "Can you find something blue? Great, now let's look for the letters that spell blue ..."
The basement bathroom includes a shower with grab bars. 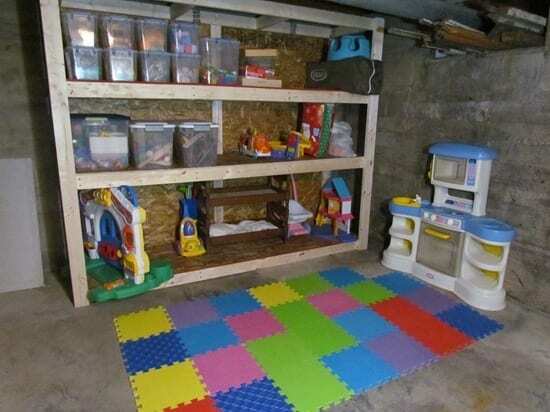 This corner of the unfinished area in the basement has a shelf for storing large awkward toys plus a play mat for enjoying them. The family likes to be prepared in case of emergency, so they have extensive supplies stocked up. 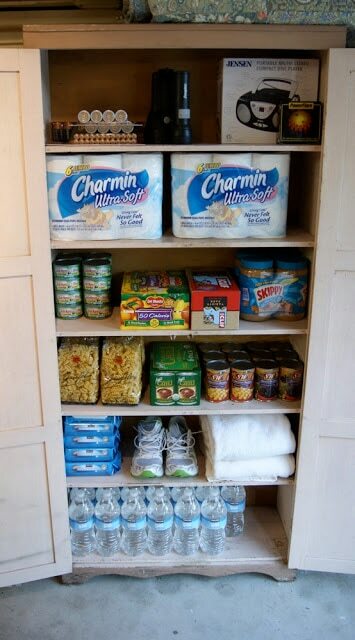 This cabinet holds household goods such as batteries and toilet paper. The pantry contains all kinds of canned and dry goods. They check expiration dates once a month and replace anything which will expire within four weeks, then cycle the older stuff up into the house for immediate use. 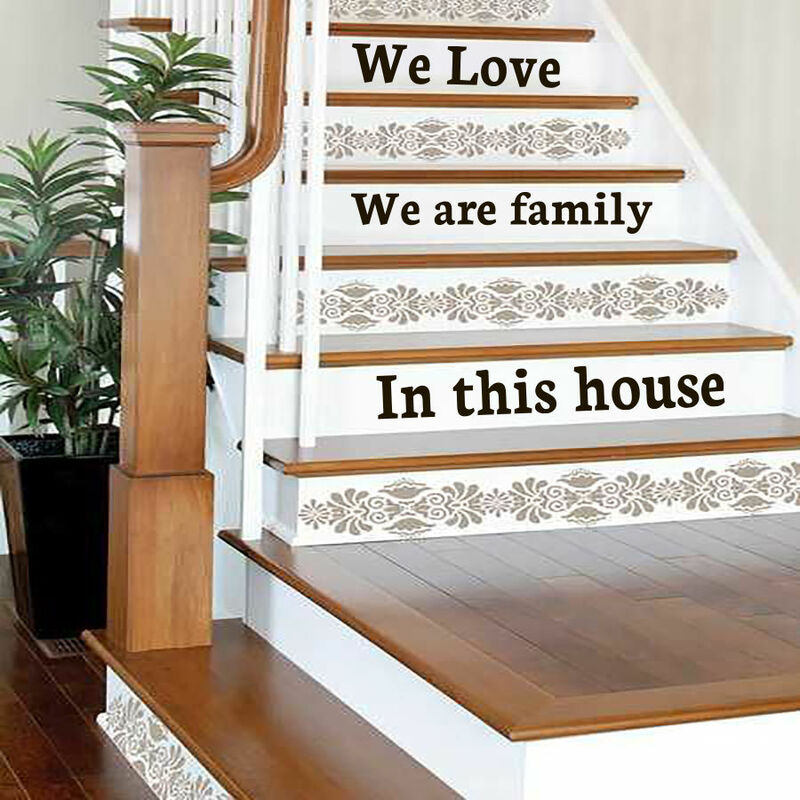 At that time, friends and family members are welcome to take home whatever of it they can use quickly. The root cellar section of the basement holds assorted fruits and vegetables for long-term storage. Another part of the pantry holds all the home-canned jars on shelves made from boards and concrete blocks. The bulk food storage area includes boxes and buckets of stuff like beans, rice, and freeze-dried vegetables. They also stock Meals Ready to Eat, which like Spam are comfort foods for many veterans. The mudroom has a bench with baskets underneath it for holding shoes, and hooks above it for hats, coats, etc. The far side of the mudroom has the laundry closet, with another door between them. The living room contains clusters of furniture. This one is along the interior wall. The kitchen lies behind the dining room, at the back of the house. The master bedroom is to the right of the kitchen (facing the front door). There are two more rooms upstairs, with a large landing. Those used to be the children's rooms; now one is a guest bedroom and the other is a craft room with a daybed. The stairs to the second floor come up the outside wall from the dining room and kitchen. The back door is to the right of the kitchen window in this picture. There are two wall ovens to the left of the rangetop. The den to the right of the living room has another fireplace. The paintings are from local artists in places that Ansel's grandfather visited on vacation. The den has a closet to the right of this picture, toward the outside of the house, adjacent to the powder room. 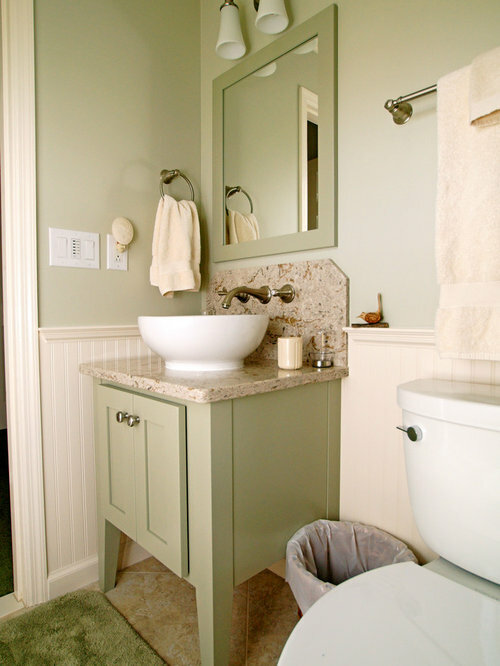 The powder room lies between the den and the master bedroom on the right side of the house. The master bedroom includes a queen-size bed, two end tables, and two benches. 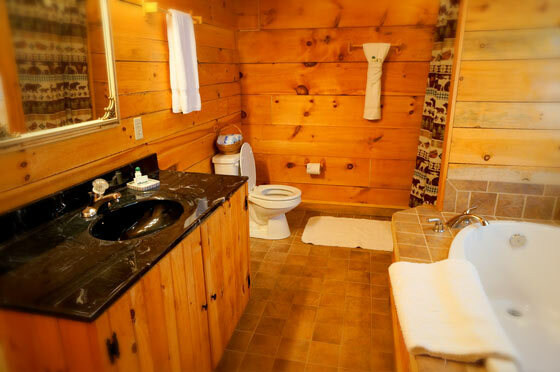 The master bathroom was remodeled with a design for aging in place, after Ansel's grandfather Conrad had a tractor accident a few years ago and was laid up for a while. They figured it was a good time to upgrade while he was in the hospital. The handheld showerhead is above the bench seat. The stairs begin between the dining room and kitchen. 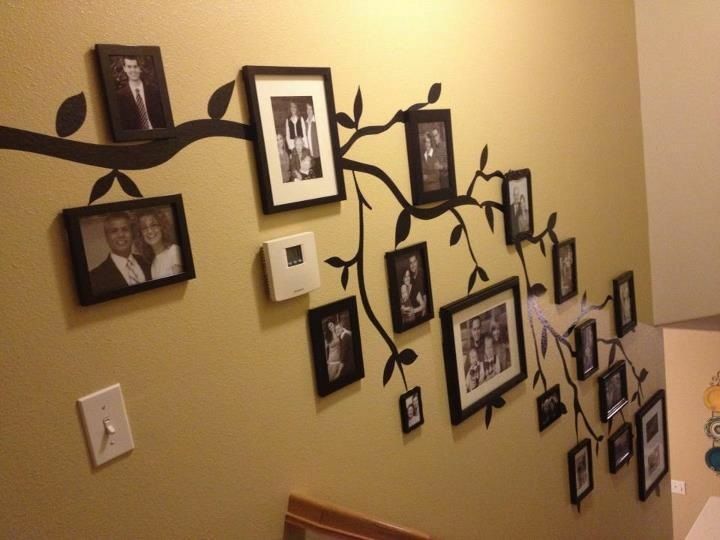 A gallery of family photos rambles up the wall beside the stairs. The upstairs landing includes a reading nook with built-in shelves and two chairs. The craft room has shelves, a sewing table, and a full-size bed for guests. 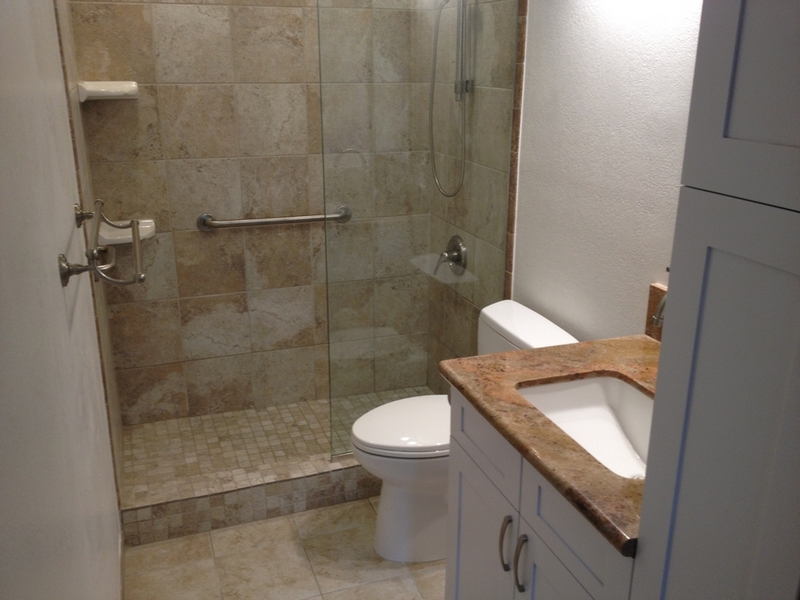 The upstairs bathroom has grab bars added with suction cups. 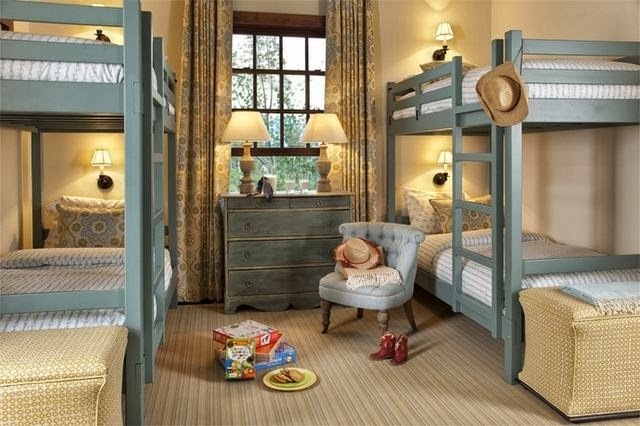 The guest bedroom has two pairs of bunk beds.